Our #253BusinessSpotlight post this week will be focused on Bleach. We at Sky Creative were lucky enough to interview Bleach owners John and Julia Couch. Their locally owned business has been located in Downtown Tacoma since 2010. Created off of a storied sales career, Bleach sports a multitude of different styles and personalities that anyone can vibe with. John and Julia continued their expedition into fashion retail business by opening Bleach in the space they’re found in now with a total of four business partners. 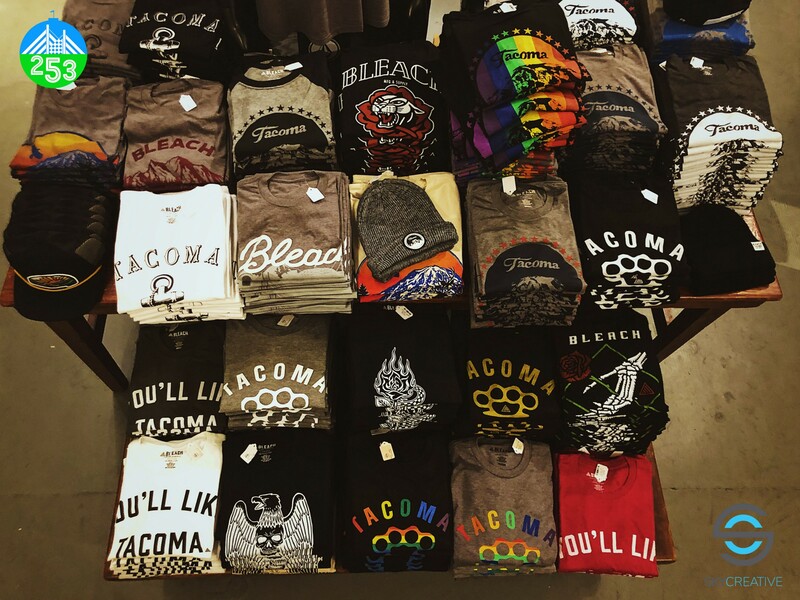 Now owned solely by the Couch family, Bleach has grown to be one of the number one clothing stores in Tacoma. Backboned with popular local brands such as Imperial Motion, Paper Diamonds and their own personal brand. Bleach gets festive with their window designs and decorations. The name Bleach has many different derivatives. Ranging from their mainly all white stock to their triangle logo representing the “Do Not Bleach” logo in T-shirts. Perhaps the greatest inspiration for the brand is John’s favorite 1989 Nirvana album of the same name. The Aberdeen born band has continued to be a cornerstone of North Western culture, and Bleach continues to carry on the inspiration brought to us by the iconic group. Bleach’s inspirations carry on into their products. Like Washington, the genre and styles carried in the flagship store are diverse and varied. These different styles range from streetwear, localized pieces, lifestyle clothing, and action sports. All top three selling brands are locally owned. These brands include Paper Diamonds, Imperial Motion, and their own personal Bleach brand. 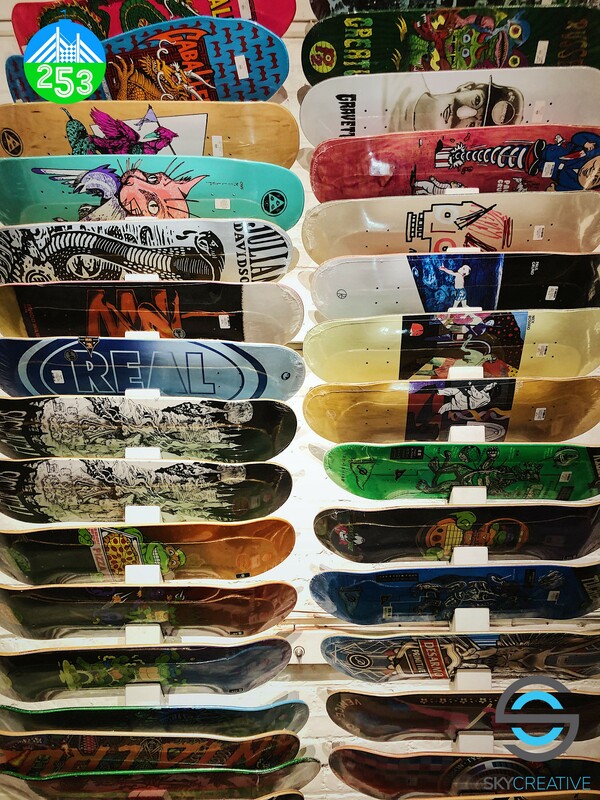 Along with their clothing stock, Bleach prides themselves in accessories and skateboarding retail as well. The store has a wide range of different products that are catered to all ages, fashions, and lifestyles. Bleach has gone hand in hand with the Tacoma community since their start. Downtown Tacoma is sometimes considered to be out of the way for shoppers. When asked how the community has been a part of their history, John mentioned that the long-standing customers of the area continue to inspire them. The past nine years were possible due to the loyalty of their fans. Bleach reciprocates this love for the local fashion and retail community by making their retail space an open source for artists and designers to display their clothing brands. Bleach values the artistry and dedication it takes to create your own brand, and they wish to continue to support local creators in that way. 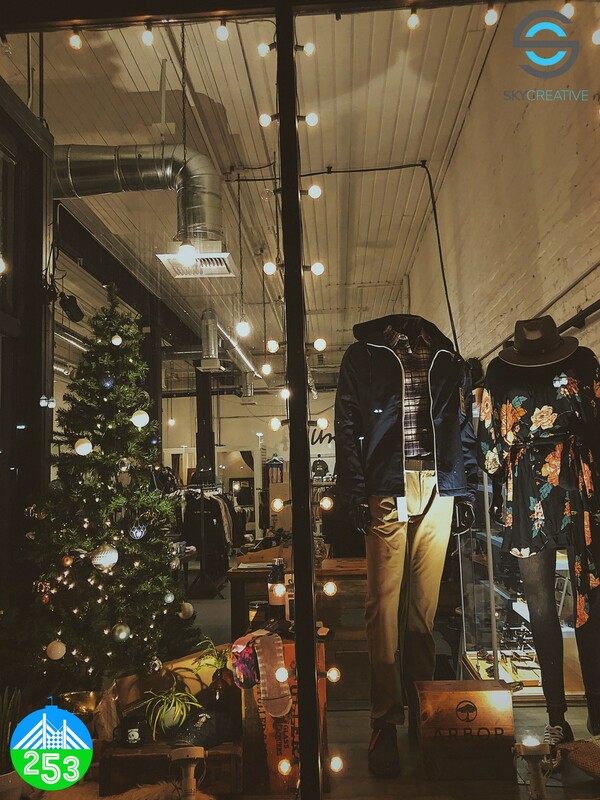 Along with this Bleach also offers events such as getting together to celebrate the retail community in the shop where visitors can relax, meet new people and buy clothing in a retail party setting. You can find out about these events by visiting their Instagram and Facebook, which will be linked down below. The layout of the front of the store represents top selling items at Bleach. When asked where the brand looks to be within the next 5 years John mentioned the goal of expanding beyond Tacoma. Their unique brand of equity, fashion and dedication are bound to be successful in other markets, and it’s only a matter of time before they can expand their horizons. With hopes for future expansion, Bleach wants to continue to serve the community through hosting and sponsoring future events and festivals. You can check all of Bleach’s events on their Facebook page titled “BLEACH TACOMA”. These events are great ways to both directly contribute to the community (usually for a purpose even greater than Bleach itself) and get some shopping done! Lastly, John and Julia mentioned that Bleach’s 10 year anniversary is on the way in the near future. As Bleach always has, they are planning on changing the game and pushing their creative boundaries. Julia stated that there will be a lot of changes to the Bleach brand that everyone will want to see. The way that they put it, it’s going to be huge both for Bleach and the city of Tacoma. This is a developing story, and we will know more as time will tell. For future releases, events, and news involving Bleach check out their Social Medias @bleachtacoma. For more information on Sky Creative, including future 253 Spotlights, give us a follow @skycreativeevents and like our Facebook at “Sky Creative”. This article was written by Kade Maijala. For more information on scheduling a ‘253 Business Spotlight’ interview contact kade@theskycreative.com.